The singletrack awaits. 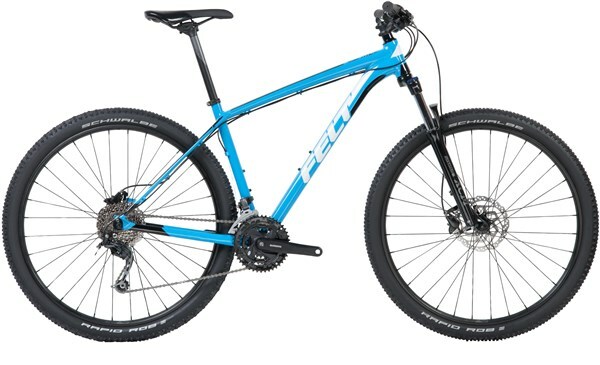 The Felt Dispatch 9/60 29er is a rapid hardtail mountain bike that features a lightweight aluminium frame with dialled XC geometry. With its SR Suntour XCM suspension fork to smooth the trail the Dispatch is ready for cross-country adventures and even a bit of XC racing. The Dispatch 9 features many of the same technologies developed for Felt’s high-performance, carbon Doctrine Series. These include a contemporary hardtail design and a 29-inch wheel platform. This gives the Dispatch 9 exceptional rollover capabilities and handling characteristics. The Dispatch 9 includes a 6061 aluminium frame for maximum durability, as well as a suspension fork that provides front-end damping to further enhance the bike’s already impressive ride quality. Featuring a rugged frame crafted from Felt’s SuperLite hydroformed aluminium, the Dispatch 9/60 is paired with an SR Suntour XCM fork with 100mm of travel. It rolls on 29-inch, tubeless-ready wheels, and it’s built up with a mixed drivetrain that includes top-shelf components, including Shimano hydraulic disc brakes and a SRAM NX Powerspline crankset. Headset: FSA semi-integrated, No.10, 1.125"
Front Tyre: Schwalbe Rapid Rob K-Guard, folding, 29 x 2.25"
Rear Tyre: Schwalbe Rapid Rob K-Guard, folding, 29 x 2.25"